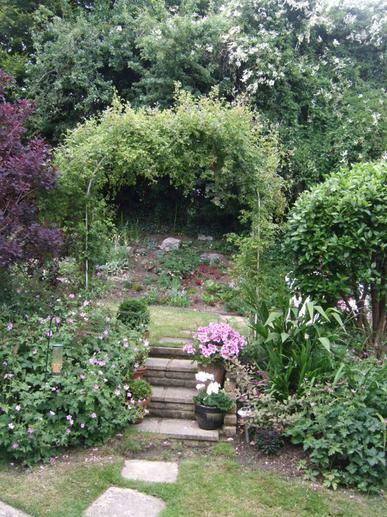 Wivenhoe Open Gardens has been an annual treat in the town since 1987, when Anne and Len Horner persuaded the owners of some seventeen Wivenhoe gardens to open them at the end of May, to raise funds for St Mary’s Church in Wivenhoe. It was a resounding success (some £700 was raised, tickets for the two days costing £1), and our annual Wivenhoe Open Gardens weekend was launched. Since 1987, the event has grown, these days with around twenty-five gardens or more to visit. They range from a collection of pots, lavishly planted, to rather larger gardens with lawns and flower beds, allotment-type gardens and the schoolchildren's adventurous gardens, to wildlife gardens, gardens with sculptures and artwork and gardens with animals – it varies from year to year. There is also a stall selling cakes and produce, and sometimes there is music to be heard in some of the gardens. You can also have tea and cakes, and other refreshments, at several of the gardens as you make your way round. The weekend is now organised by a team from St Mary's Church and The Wivenhoe Society, all proceeds divided between the church and local good causes chosen each year by The Wivenhoe Society. There's plenty to see around the town as you visit the gardens, and the weekend has become a great chance to meet the owners of the gardens and friends, and to share their enjoyment. It's on Saturday 19 and Sunday 20 May this year (11 o'clock until 5 o'clock each day), so don't miss it! Tickets (including a free programme!) cost £5 for the whole weekend – children admitted free of charge with an adult – and will be on sale from the beginning of May, at Crossways Stores, Fleur Parfait florist, Michaels estate agents, Bryan's Newsagents and the Wivenhoe Bookshop. See you at Wivenhoe Open Gardens 2018!